Cutting speed (band speed) depends on tensile strength, type and cross section of the material. For higher tensile strength you have to choose a lower cutting speed. Smaller cross sections can be sawn with a higher cutting speed than larger cross sections. The feed (cutting pressure) depends on the material cross section. For larger material cross sections you need a high cutting pressure. Thin pipes and profiles as well as sharp edges are sawn with low pressure and - if possible - with constant feed. The life of a band saw blade can be increased significantly by following the recommended break-in procedure. 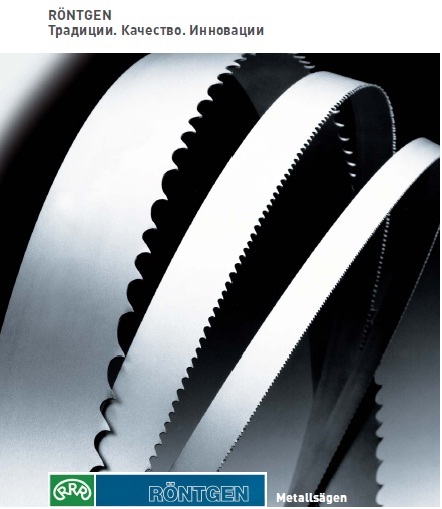 A new saw blade benefits from a short period of cutting at reduced band speed and cutting feed rate can be selected from the chart above. The recommended maximum production band speed and feed rate can be selected from the chart below. The break-in rates should be set at 70% of band speed and 50% of feed. Tapes with this symbol are products of superior quality and are applied in extreme cutting conditions. Increasing the content of alloying additions - up to 10% of cobalt and tungsten to 10% significantly increased resistance to abrasion of teeth and high temperature. Features different from the M41 series of tapes: increased durability and improved cutting accuracy. This tape series provides great cost cutting very difficult for working with materials such as nickel and titanium alloys. © 2009 - 2010 АТОН ДД ЕООД. Всички права запазени.